The Intense Series 5200 of laser modules combines multiple 1200 series diode lasers with a bundle of seven optical fibers arranged in circular arrangement that allows efficient coupling into 400um or 600um core 0.22NA or larger optical fibers. The coupling is managed with an FC coupling. (A seven-segment mini-array is optically coupled to seven fibers.) The parallel configuration of the array is easily driven with commercially available laser current drivers. 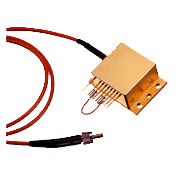 The internals of the High Heat Load package include Thermoelectric cooler, monitor photodiode and thermistor. The output fiber bundle is in an armored cable terminated at an FC connector.